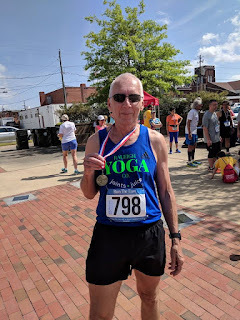 Right now all of my training and racing is focused on being the best prepared that I can be for the Cotton Row Run 10k on Memorial Day so I was looking for another 10k in April to use as a test as well as some specific distance prep. There are numerous racing options every weekend in the area this time of year but this one in my former hometown seemed like the best to suit my needs. The race has been around since 1979 and I was a participant that year as well as several other times over the years. The course has changed a few times but the current course happens to be the one that I won the overall title in a different race back in 1987! In the past this was a well attended event but over the years things have change and there is so much more competition from other races. Most that did come chose the 5k option and there were only 40 finishers in the 10k. It's a bit sad because they put on a quality event with a certified course, chip timing and more giveaways from local sponsors than most much larger events. And the post race food was awesome ! The one thing that I wasn't too happy about was the late 9am start. It was a warm morning in the 60's and the sun was high already and due to the east -west orientation of the double loop course we had no shade and direct sunshine for 90% of the run. But we take what is given and go for it. After all, everyone had to compete in the same conditions. And speaking of competition, this is how the race went. I didn't know anyone near my age but did notice a couple of fit looking grey hairs in the small field as we lined up. My goal was to run as close to 7:30 pace as possible and see what happens. Based on my 4 mile race a few weeks ago I was fairly confident but that morning was 30 degrees cooler ! I didn't feel too spiffy in the warm up and had been a bit flat feeling the last couple of runs but you never can tell until the race starts. As we begin I noticed one tall slim guy that seemed fit and older than me slowly pulling away. I tried to hang on to his heels and after about half mile in I eased by and hoped that was the last I would see of him. I felt pretty good and hit mile one in 7:23, nearly perfect. But then here he comes up on my shoulder and passes me. We stayed within 2 steps of each other over the next mile which was a disappointing 7:45. We were into a bit of a headwind then but it didn't seem too bad. I just kept pushing and hoping I could pick it up. Mile 3 was the same with the two of us in near lock step. He pulled away slightly on a downhill but I pulled nearly even going back up. Mile 3 was another 7:45. Oh well , no fast time today, just focus on the racing. We headed out on the 2nd of the two loops still neck and neck. As we approached the 3rd hill I stayed closer on the down and then felt a weakness and decided to make a move going up. This is where I got a little chuckle. As we were starting up he could hear me coming and decided to offer me some advice. He said, pump your arms going up, it will help you run faster. I almost laughed out loud but just thought to myself, Dude, I have raced about 500 times over 41 years. I think I know what I'm doing here. I made the pass and just kept thinking. Break him. I hope I broke him ! After a few minutes his breathing seemed to be fading ! But mile 4 was a bit slower still in 7:51. 2.2 mile to go, just hang on and keep pushing. But then at mile 4.5 here he comes by me with a "nice pace" complement ! I tried to hang on to his heels once again but I was hurting and soon after he began to pull slowly away. By mile 5 he was half a block ahead and I was dying with a slow 8:12. I so much wanted to just back off. No fast time and I wasn't going to win this race but as quickly as those thoughts came I swept them away and dug deep. For a few moments I slowly closed a bit of the gap and was hanging on to the hope he was hurting as bad as me and may crumble but when we hit that final hill it was over as he powered off into the distance. I struggled and hit the turn at mile 6 with a joggy jog paced 8:26 and he was a block ahead. I tried to look as good as possible in the homestretch to make myself look worthy of the Raleigh Yoga Company Singlet I was wearing. Finished in 48:59. I walked over to congratulate the guy. He was very friendly and we enjoyed several minutes of conversation before he finally asked me what age group I was in. When I said I was 62 then he replied, oh well you probably easily won your age group. He said he was 55 ! Wow, I was still thinking he was older than me ! Here I was racing my guts out against a guy 7 years younger. Cool ! And yes I did easily win. Only one other over 60 and he was 20 minutes back ! Enjoyed waiting around for the awards with my cousin Jennifer who took the picture for me. none from the actual running. It wasn't until later and looking at the official results that I realized my time was exactly what I ran in my first race back in March of 1978 ! That was The Natural Run 10k in Winston-Salem. If you can and like 5 and 10k's come give this one a shot. I really enjoyed walking around the downtown area and trying to remember the many stores and theatres I went in as a child and shopping with my mother and brother and Aunt and cousins and grandparents.